This isn’t about financial management, just organization for when you lose your wallet. I carry a pretty minimal wallet; a little cash for tipping, 2 credit cards for personal and business expenses, driver’s licenses and medical insurance card. Recently I lost my wallet, ugh! What now? The biggest nuisance was one I realized could have been entirely avoided! Tracking down all of the recurring charges that drew from the lost credit cards and pointing them to a different one before charges started getting declined. Finding the monthly charges wasn’t too terrible, just skim through the last month’s credit card statements, find the charges, log on to each vendor website and setup a new card. Cell phone, internet, car insurance, utilities and any other monthly subscriptions. The bigger head ache was trying to figure out those non-monthly charges. I think I got them all, we’ll see over the next year! The solution? Get a credit card and dedicate it to those recurring charges…and then never carry it with you. If you can, set it up for automatic payment and put it away. 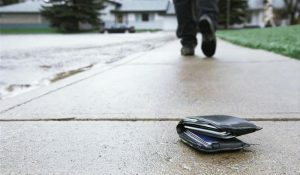 Now if you happen to lose your wallet (again) it’s still a pain, but what I found to be the worst part is now a non-issue. If I’m stating the obvious you can hate me in the comments, but I wanted to share what was a forehead slapping moment for me. This entry was posted in Life Hacks. Bookmark the permalink.